It was a rather surprising elimination on the second go-round of the Top 7 on "American Idol." Following a rather manically terrifying group sing on "Dancin' in the Streets" (seriously, those balloons? What, was somebody the one millionth customer? ), the first person put in the Bottom 3 is Hollie. Not a huge shock, though her "Rolling in the Deep" was great last night. Elise is the next member of the Bottom 3, which is also not a shock. 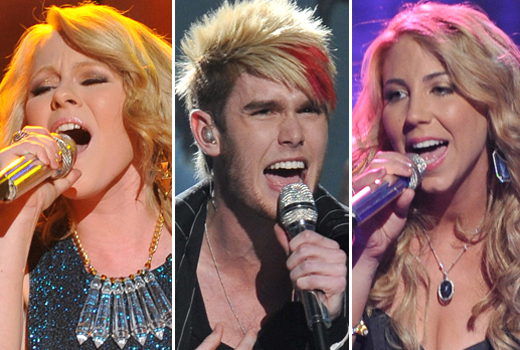 The final member, though, is a little bit of a surprise - it's Colton Dixon. He wasn't that strong last night, so it's only a surprise because it's his first trip to the Bottom 3. Then Elise is pronounced safe and while we are very happy about that, we are pretty surprised. We are even more surprised when Colton turns out to be the one going home. Again, we thought he was pretty weak last night. But it's his first trip to the bottom, plus guys seem to have an easier time on this show in recent years. What do you think, "Idol" fans? Did the right one go home?